Basically, I find that it returns too many places, places where that method isn't even being called. Places in text that are obviously not calling a method. Here is a screen shot of what I mean. Notice the dynamic finds. Those are using dot notation to get a value from a field of a domain object, not even remotely related to the interface. We have seen this a lot in the past few months. Where it causes days and hours of extra work because it happens when you do a refactor-rename. You rename a method and anywhere that word in the method exists gets changed and breaks other code that wasn't calling that method, but had something with the same name. 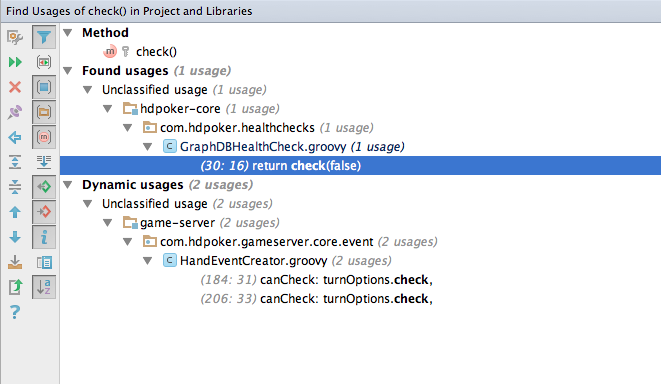 This had never happened before in the about 10 years of using IntelliJ. IntelliJ used to be the best IDE, especially for refactors and now I can't trust it anymore.